It was late. The lab administrators were gone, and I work 95 miles away from our data center. At work, we’re working on setting up a new and improved QA/Testing rack of equipment, and I was trying to run my automated tests. Unfortunately, I misread a memo, and didn’t know where the data was going. For our testing purposes, we have a custom replay appliance that exposes its operations via a RESTful API. Our CPX platform does as well, more on that in a second. So, when I passed some commands to the replay box, I didn’t get the data I expected. I tried again. Nothing. Hmmm.. No one was there to help troubleshoot, so, I had to figure it out, remotely. I have access to a bunch of machine in our development and test lab, so that helps. Using ‘my’ general virtual machine (Debian 6 Linux), I set up a graphite-web installtion. More on that later. It’s kind of a bear to get installed on Debian. Then, simply enough, I loop the CPXs, build my URL, make a tornado request, and get the data back. Then I loop through the stats of interest, build the appropriate Graphite formatted string, append it to my buffer, then send it away. #Keep doing it. 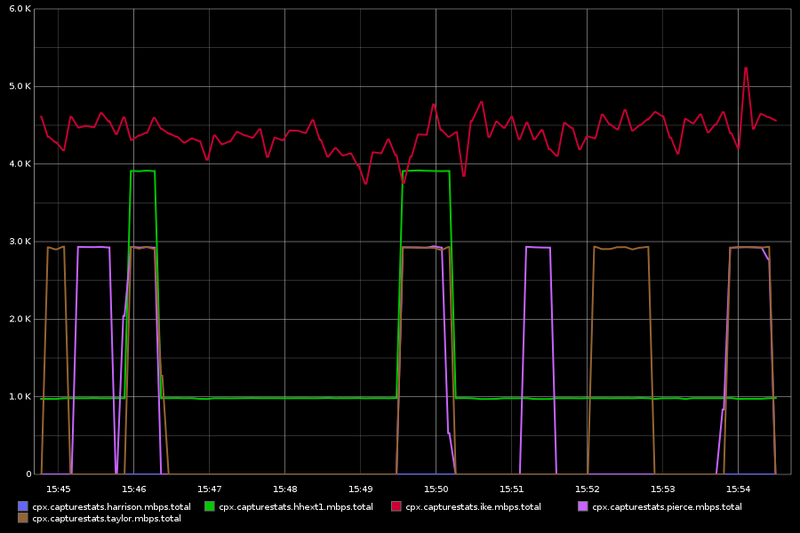 There's enough delay in each HTTP request so nothing gets overwhelmed. # I'm keeping a total per CPX. This is a quick way to aggregate the data to simplify some visualizations. # for improved performance and data localization. #You'll see here, I'm pumping in data per feed. What I found to be the simplest way of charting exactly what I wanted to chart, was to use the ‘render’ API that graphite-web provides. Essentially, it’s a URL that outputs a PNG based on parameters. It even takes a wild card, so, in one fell swoop, I can get a PNG showing the total ‘mbps’ per CPX. Looks like this, for our ‘steady state’ traffic. Not replaying any traffic from my source. These boxes have data from elsewhere. Then, after doing some experimentation with our replay end point, I can watch the graphite charts, to see which CPX is getting traffic, based on different parameters. Pretty slick! Now, I know where my traffic is going! 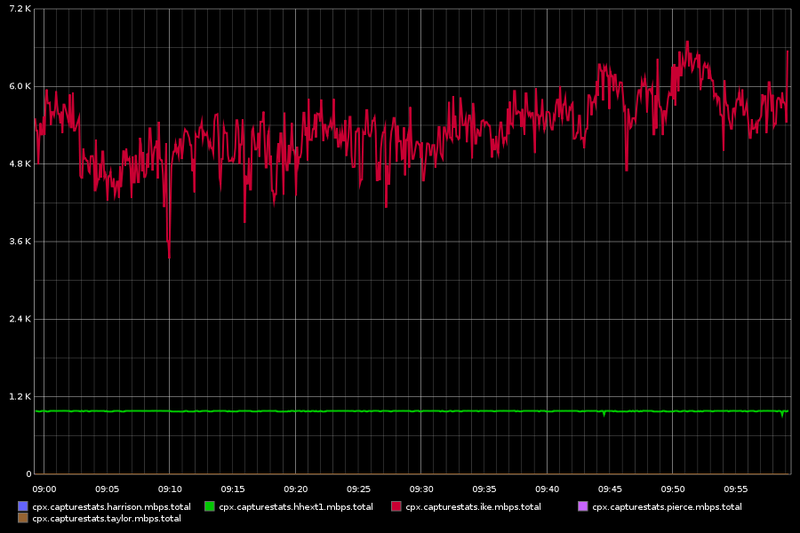 Each spike shows what CPX received traffic.